There are two types of blames; lip balm as well as balsam and salve. Salve is similar to Vicks, which is like ointment. While lip balm is a hard balm like the regular lip balm you get outside. All these balms have one thing in common which is the ingredients in it. They are all the same; the only difference is the consistency and the texture. There are only three main ingredients in the balm. The first is bee’s wax, which is the hardener. The second one is liquid oils like coconut oil, sweet almond oil and olive oil and the last one is butters like shea butter and cocoa butter. There are many ways to modify the recipes. It really depends on the texture and consistency. This really depends on the kind of balm you are intending to make. When modifying the balm, there are two things that you need to take into consideration. The first would depend on the area of application. It could be applied on your lips, hand and elbows so different places would require different texture and consistency. Another thing is the packaging. If you were to make a lip balm, you would want to make sure that the balm is hard enough to stay in the packaging and it is soft enough when it touches the skin. If I were to make a lip balm, I would usually use about 20% - 30% of beeswax, 40% butter and 30% liquid oil or if I were to make an ointment for baby nappy rash, depending on the packaging, I would use less beeswax and increase the liquid oil to make it soft. Ill be talking more about this in tomorrow's post so do check it out. One thing about balms, they are 100% oil based. So what this means is that you can’t add anything watery to it because it will not be able to mix properly. Even if it does, in 3 months, you will be able to see the oil and water separating from one another. Alternatively, you may insert sugar or salt if you want something scrubby or even dried powder or essential oils. However, essential oil maybe too strong on your lips and I do not recommend using it. You may also add herbs like dried mint or other herbal oil to your balm. Ill be talking about additives in the next post. Click here. So this basically summarizes the basics in making balm. 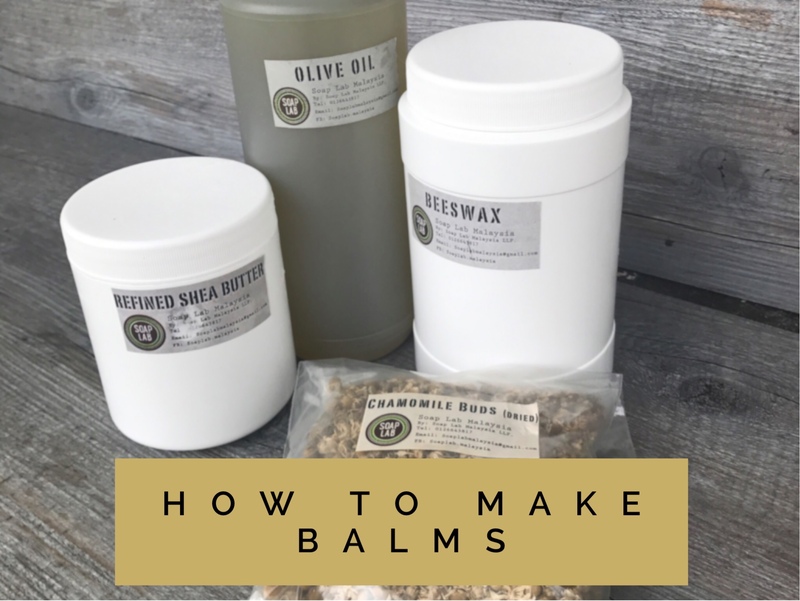 Tomorrow ill be talking about the oils and how to change them according to skin type and recipes, and on wednesday ill be showing you how to make a basic balm.